Faith Cabanilla, an educator from Davao, gave a message to the leaders and goers of the church through her Facebook account encouraging them to serve the Lord, and not the men behind the Catholic Church who have been perpetrators of crimes. 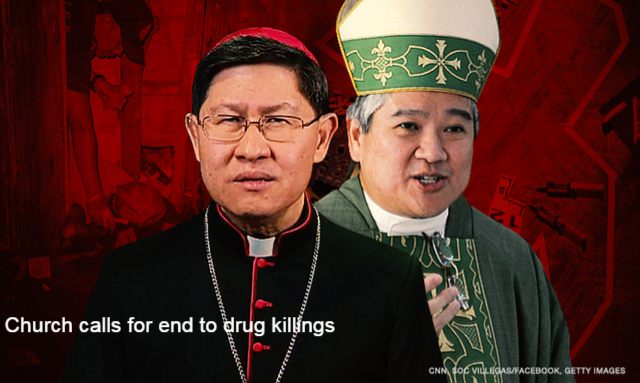 This remark came after Cardinal Luis Antonio Tagle and Catholic Bishops Conference of the Philippines President Archbishop Socrates Villegas was reported to have encouraged the Filipinos to reject drug killings under the President Rodrigo Duteret administration and pray for victims. 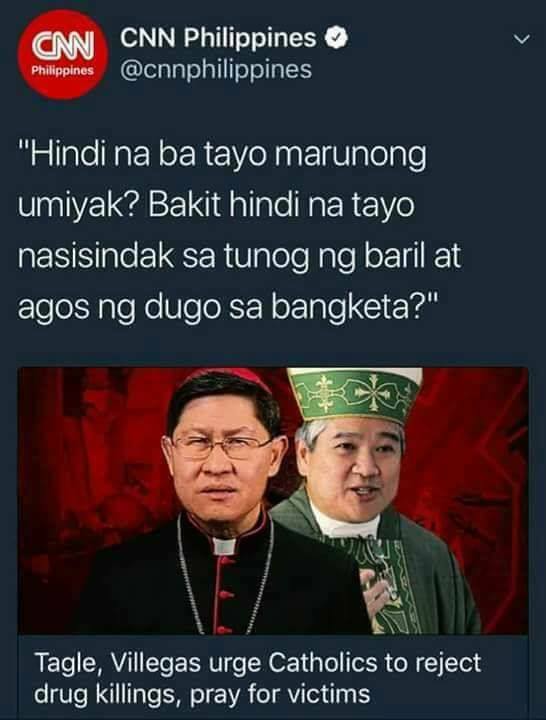 Cabanilla said that she honors the faithfulness of the leaders to their God but they "have a choice", to listen not to the men who allow evil to run rampant in the church, men who collect coins and donations "but you never really see where they go" and men who have engaged in horrendous activities for their carnal desires. "You have the responsibility to call out the masters that have turned faithfuls like you into slaves. You have the responsibility to safeguard the true teachings of Christ, to restore the holiness of the Faith you were baptized or married to," she said. She added that it is the church leaders' responsibility to demand the truth in disconcerting issues, and accountability for every undertaking of the parishes. "It is your responsibility to bring honor, not to the men who wear those elaborate garments while they preach empty words and wash your sins away with holy water, but to the God you were born to serve. Guard your Faith, not the humans who have maligned it," she said. "And while there is Divine Justice, you must learn to recognize that there is also Human Justice. Flawed you may think it may be, but it is necessary," she added. I honor you, and I honor your Faith. I honor that you have chosen the religion you belong to. I honor that you recognize the Power that is unseen and unwavering, the Hand that you believe that gave us all life and freewill and the choice to follow His teachings. I honor that you have memorized the scriptures in the book that tells of the many faces He has. I honor that you believe in the power of prayer. Of grace, of pardon, of deliverance. "Forgive me for my sins. Forgive me for I am a sinner. And the messengers of the god you were taught all your life to serve. You have seen their imperfections, and I honor that you have chosen to look beyond them. Infallible and trustworthy, they are to you. You are sad, and maybe even angry now that the institution you have believed in your entire existence is slowly crumbling. And the lights from the candles on the altars have dimmed. The churches, built on stone and by the hands of your ancestors, have turned to ruins because of the earthquakes and the typhoons. It is the Hand that wanted them there that destroyed them. Do you see the message He is trying to tell? Can you truly understand His ways? You are filled with fear. And sadness. And anger as more injustices from the very men who were supposed to lead His flock are being brought into the light. Rightfully so, because that is your Faith, right there, being tested. I honor your sadness and your anger. I even honor your fear. Let go of the fears and allow yourself to grieve. They are only men, and nuns. They are only human. They are only churches and can be rebuilt again. Was it not taught to you, as you listened to homilies and in your prayer groups, that you have freewill? That you can choose your own path? Was it not taught to you, that the Savior you pray to, has already redeemed you with his blood and you come into this world with a clean slate, that you can live your life according not to His plan, but yours. That He will guide you, and be with you, and protect you always. But you have a choice. You have a choice not to listen to the men who can allow evil to run rampant in your own community, who collect coins and donations from the poorest of society but you never really see where they go, who have been caught time and again engaging in horrendous activities just to fulfill their carnal desires and their unimaginable greed. But more importantly, you have the responsibility to call out the masters that have turned faithfuls like you into slaves. You have the responsibility to safeguard the true teachings of Christ, to restore the holiness of the Faith you were baptized or married to. It is your responsibility to invoke all powers that be to aid you in the cleansing of your Church, to demand the truth in disconcerting issues, and accountability for every undertaking your parish does. It is your responsibility to bring honor, not to the men who wear those elaborate garments while they preach empty words and wash your sins away with holy water, but to the God you were born to serve. Guard your Faith, not the humans who have maligned it. And while there is Divine Justice, you must learn to recognize that there is also Human Justice. Flawed you may think it may be, but it is necessary. As you trust your God, you must know too, that He trusts you. Now, learn to honor your Self. "Institutions will crumble, but your Faith must be stronger than that."